My husband and I have raised five sons in Utah. When the boys were little they would bring home an assortment of wild creatures, such as a mother snake that surprised everybody the next morning with a large number of baby snakes. Frogs and dogs and iguanas would escape and be discovered in the upper reaches of their mother’s bedroom closet. The iguana got bigger and so did the boys. I keep my paint brushes busy illustrating picture books and painting watercolors. I love to turn a page of well written words into characters and images that live in a book. 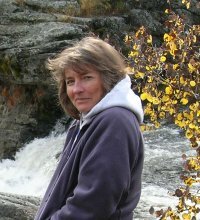 I attended Utah Technical College in commercial art and after graduation worked in advertising but soon attended children’s book conferences and began working on my first book dummies. The first book I illustrated was “ The ABC’s of Uniforms and Outfits” written by Barbara Williams published in 1992 by Winston Derek Publishers in Nashville, Tennessee. I have illustrated nine picture books since then. I’m the Illustrator Coordinator for the Utah/So.Idaho Region of The Society of Children’s Book Writer’s & Illustrators, a signature member of the Utah Watercolor Society and a signature member of the National Watercolor Society. In May of 2007 I traveled to Kenya Africa and visited St. Catherine’s School at Naivasha where I painted murals on the back of three classrooms and talked to the students about illustrating books. Each book is an adventure.